Have you heard of dukkah? It's a delicious Egyptian condiment full of nuts, spices and herbs. We're so inspired by our dukkah suppliers - they ONLY make dukkah, so they're absolute experts - that’s why we've made it spice of the month! Voilà! Preheat your oven to 200 degrees. Fill a pot with the water (amount specified in the ingredient list) and the chicken stock pot, and bring to the boil on high heat. Once the water is boiling, pour in the bulgur wheat, place a lid on the pot and rest off the heat for 15 mins, or until the water has completely soaked into the wheat. Tip:The bulgur can rest for more than 15 mins, it will just keep warm in the pot! 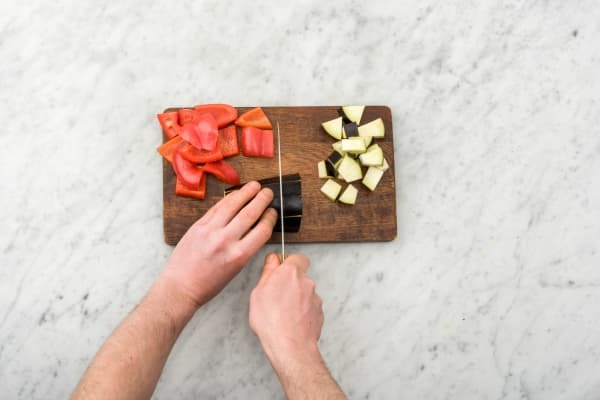 In the meantime, cut the aubergine in half lengthways, cut each half into strips and then chop the strips into roughly 2cm cubes. Remove the core from the red pepper and chop into roughly 2cm cubes. Thinly slice the spring onion (keep the white and green parts separate). 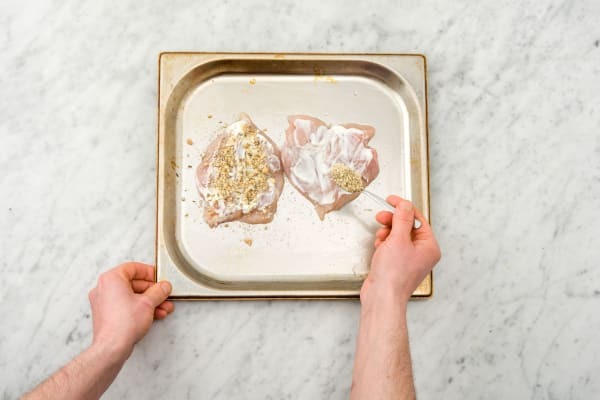 Lay the chicken breast on a chopping board, place your hand flat on top and slice into it from the side. Open it up like a book. You’ve now butterflied your chicken! Repeat for the rest of the chicken. While everything is cooking, get cracking with your washing up! 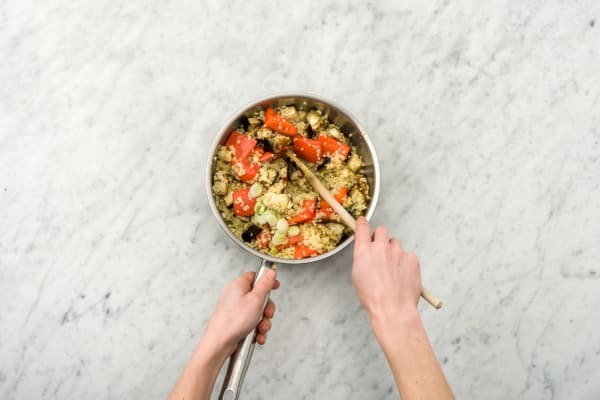 Once your veggies are cooked, take them out of your oven and add them to the pot of bulgur wheat along with the whites of your spring onion. Stir everything together. Tip:If there are any juices left in the chicken tray then pour them into the bulgur too! 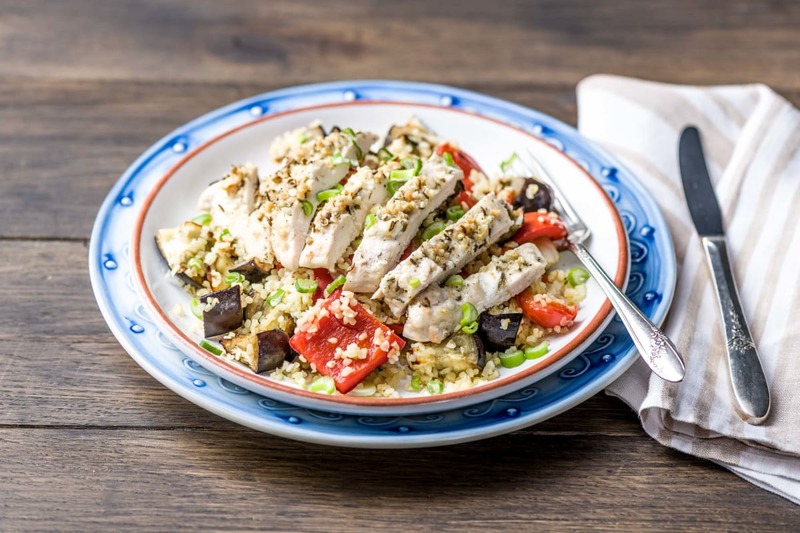 Cut your dukkah crusted chicken into 2cm wide slices and serve on top of your veggies and bulgur wheat. Sprinkle over the greens of your spring onion and tuck in!